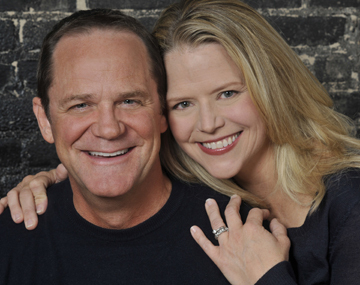 The Reagle Music Theatre of Greater Boston has announced that Broadway stars (and real-life couple) Sarah Pfisterer and Rick Hilsabeck have been added as special guests to the company’s annual holiday revue “Christmas Time,” now in its 29th season. Performances are December 3-11 at the Robinson Theatre, 617 Lexington Street in Waltham. This joyous holiday celebration presents all the trimmings of the season in heartwarming choral and dance numbers, beautiful costuming and custom scenery designed and painted by world renowned artist Robert Moody. Created and directed by Reagle’s founder and executive producer Robert Eagle, “Christmas Time” boasts a feast of timeless holiday favorites plus a full,professional orchestra. Sarah Pfisterer (at left) -- Broadway’s “Phantom of the Opera,” “Show Boat” --is a Reagle favorite who has starred at Waltham in “Beauty and the Beast,” “Carousel,” “The Music Man,” “My Fair Lady,” “The Will Rogers Follies,” “The King and I” and “The Sound of Music.” Rick Hilsabeck -- Broadway’s “Billy Elliot,” “Chitty Chitty Bang Bang” -- has distinguished himself as an actor, singer, dancer and teacher for more than 30 years, starring on Broadway, in national tours and around the globe. The company of nearly 40 adults and 150 children will treat audiences to a cornucopia of sights and sounds of the season. 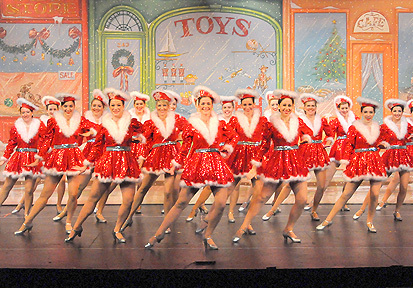 Perennial favorites include "The Parade of the Wooden Soldiers", performed by a bevy of precision tap dancers, and the inspirational "Living Nativity". A sonorous choir of 40 adult carolers presents a Victorian Christmas, and the City Sidewalks come alive with popular classics accompanied by a hand bell choir. 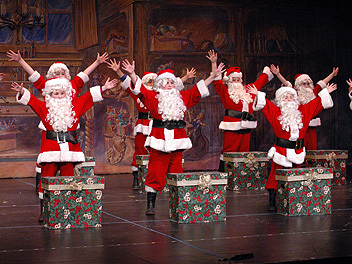 Once again Reagle will be collecting toys for the Waltham High School Student Santa Program at each performance of “Christmas Time.” Patrons wishing to donate are asked to bring new, unwrapped toys suitable for boys and girls ages 6 months to 10 years. Students from Waltham High School will be present to collect donations in the Robinson Theatre lobby before each show. The Student Santa program annually collects toys for more than 300 children living in Waltham. High school students collect, wrap, and distribute the toys, assigning them according to age and gender appropriateness. According to Stephen Goodwin, one of the faculty organizers of the program, a variety of affordable toys rather than one expensive item are desired so that each child may receive multiple gifts on Christmas day. This year the Student Santa program will be collecting toys beginning the weekend after Thanksgiving through December 21. Donations may also be dropped off at the Main Office of Waltham High School during school hours. For information and tickets to "Christmas Time," call 781-891-5600 visit www.reaglemusictheatre.org.